The Manitoba Home Builder Association Reno Awards were started in 2000 to recognize achievements in various categories of renovation: Whole House, Additions, Kitchens, Bathrooms, Basements, Exteriors, and Outdoor Structures. 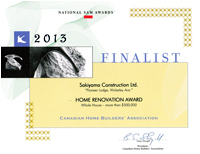 Sakiyama Construction's entries have won Reno Awards every year that Sakiyama Construction has put in an entry. This includes 17 Gold Awards. Gold and Silver awards from the last 10 years are illustrated in this section. Details on these and other renovations can be found in the Additions and Renovation sections. 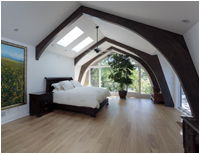 The SAM Awards are a national building awards program. Sakiyama Construction's entry "Pioneer Lodge" was chosen as one of the national finalists in the Whole House More Than $500,000 category. This biennial triprovincial adjudicated competition sponsored by the Alberta, Saskatchewan and Manitoba Associations of Architecture, recognizes projects felt to set new standards of creativity and skill. This ultracontemporary home (pictured at left) designed by 5468796 Architecture Inc. and built by Sakiyama Construction received a 2010 Award of Merit.